Africa is a land of permanent confrontation between identity communitarianism, as it brilliantly shows in the analyses of Bernard Lugan (see “l’Afrique réelle”, a monthly newsletter of the internet, whose the number 51 of march 2014, has a large file entitled: “South Africa: racial issue”, with, among other studies, “The South-Africa racial mosaic”, “The origins of the racial questions”, “The next elections will be racial”, “The killing of white farmers”). Bernard Lugan recalls: “In 2004, Nelson Mandela announced the end of the racial question, prophesying the accession of a society in which races would not be a splitting criterion”. It is the cream pie from the “rainbow nation”, made up by the Archbishop Desmond Tutu and resulting in a total failure. Lugan says: “Twenty years later, after three black presidents (…) in spite of the soothing speeches of political correctness, ideology has not made invisible races, as the rain has erased the stripes of zebras”. And whites, who remain, in less and less numerous, are victims of racism of State. Bernard Lugan concludes: “In South Africa, as elsewhere in Africa, where corporations are heterogeneous, the reality eventually catch up with ideologues”. It is checked in the mess of the Central Africa where Holland is enraged to precipitate the French army. 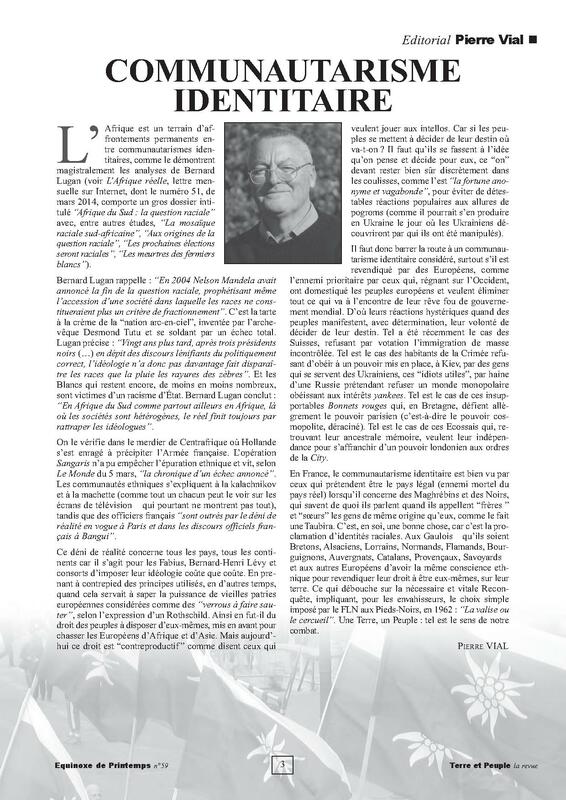 The ‘Sangaris’ operation could not prevent ethnic cleansing and lives, according to the newspaper ‘Le Monde’ of March 5th, Chronicles of an announced failure”. The ethnic communities explain themselves with the weapon ‘kalachnikov’ and the machete (like everyone can see on TV – which, however, do not show everything), while French officers “are outraged by the denial or reality, in vogue, in Paris and in the French official speeches in Bangui”. This denial of reality concerns all countries, continents, because it’s about, for Fabius, Bernard-Henri Lévy and others, to impose their ideology whatever the cost. Taking in the opposite direction the principles used in other times, when it was used to undermine the power of old Europeans homelands considered as “locks to blow”, in the words of a Rothschild. That is, it was the right of peoples to be alone, arrange themselves, put forward to hunt the Europeans from Africa and Asia. Today, this right is “counterproductive” as it says by those who want to play the highbrow. In fact, if people start to decide their destiny, where do we go? They need to come to the idea that we think and decide for them, this “we” must remain, of course, discreetly behind the scene, as is “anonymous and wandering fortune”, to avoid any detestable popular response similar to ‘progroms’ (as it could happen in Ukraine the day where the Ukrainians will discover by whom they have been handled). Therefore, it is important to stop the progression of a particular identity communitarianism, especially if it is claimed by Europeans, as the primary enemy by those who, reigning on the West, have domesticated peoples from Europe and want to eliminate everything that goes against their mad dream of world government. This could explain their hysterical reactions when people express, with determination, their willingness to decide their destiny. Such reactions were recently the case of the Swiss, refusing by voting uncontrolled mass immigration. It was also the case of the inhabitants of the Crimea, refusing to obey an authority set up by Kiev, by people who are using Ukrainians, these “useful idiots”, by hatred of a Russia claiming to refuse a nonpolar world obeying to the Yankees interests. Such is the case of these unbearable ‘Bonnets rouges’ (‘Red hats) who, in Britain, gleefully defy Parisian power (that is, cosmopolitan, uprooted power). Such is the case of those Scots who, finding their ancestral memory, want their independence to overcome a London power on the orders of the City. In France, identity communitarianism is seen by those who claim to be the legal country (mortal enemy of the real country), when it concerns North African (‘Maghrébins’) and Black people, who know what they are talking about when they call “brothers” and “sisters” people of the same origins, as does Taubira. It is, in itself, a good thing, because it is the announcement of racial identities. It is up to the Gallic – either the Bretons, Alsatians, the inhabitant of Lorraine, Normans, Flemish, Burgundians, the inhabitants of the Auvergne, Catalans, Provencal, people from Savoy – and other Europeans, to have the same ethnic consciousness and claims their rights of being themselves, on their land. This leads to the necessary and vital recovery by the FLN to the Blackfoot, in 1962: “the suitcase or the coffin”. ‘Une Terre, un peuple’ (‘Earth, people’): this is the meaning of our fight.